We have already established that I love spring. I love the sunshine. I love the puddles. I especially love the mud…even the smell of mud makes me smile. But I also love the colorful birds that start showing up on my balcony rail, chirping madly at one another for that last bit of seed in the dish. We have been seeing little tan birds with red heads and bellies, we are seeing the little brown swallows, oh…and the crows! Don’t forget the crows! Although, they are so loud, I don’t suppose we could if we tried! The kids and I try to sneak up the patio window very quietly so we can watch their silly bird antics without frightening them. 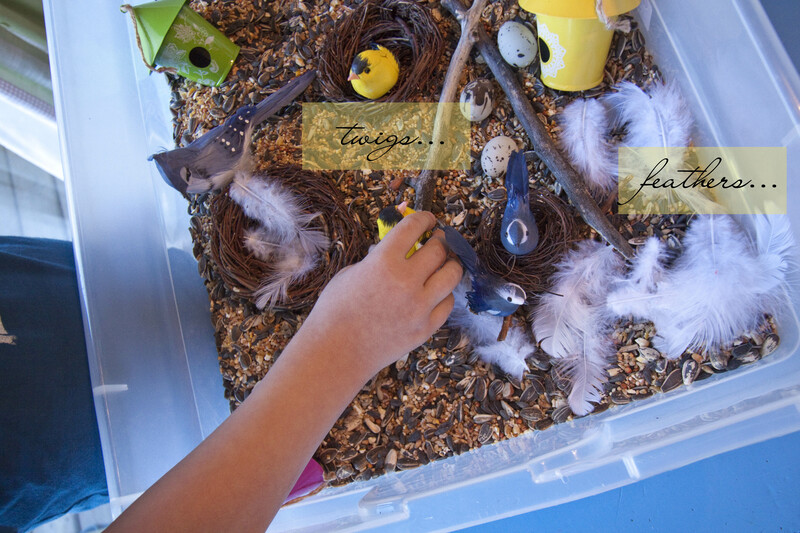 We have enjoyed our bird-sightings so much, we have decided to do a whole unit on these little feathered creatures. And what is my favorite way to introduce a new unit? 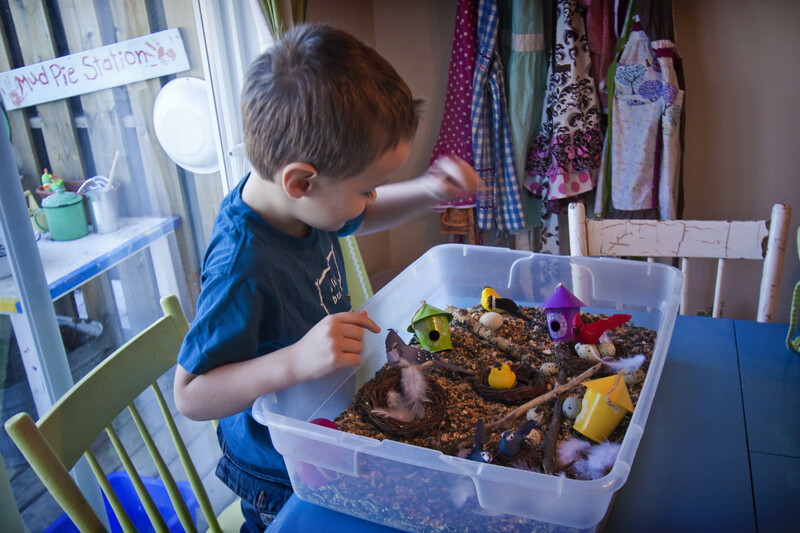 A sensory bin, of course! Hehehehehe! 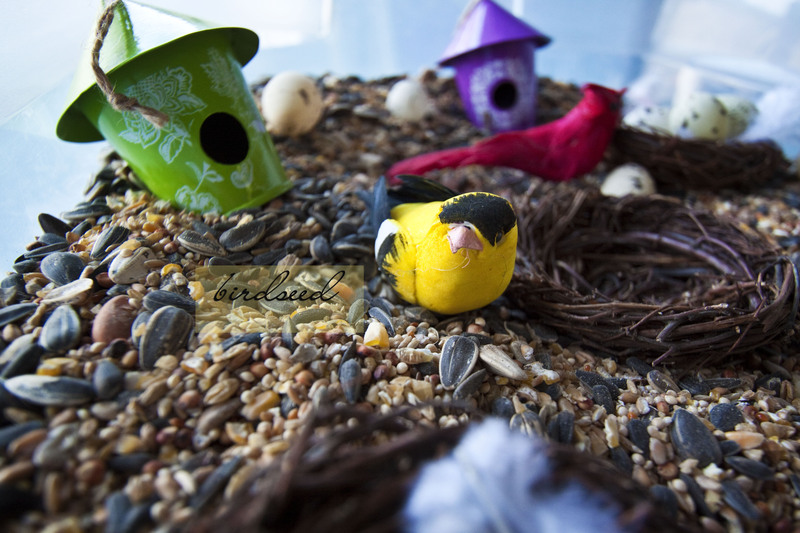 So here it is…start with a big ol’ bag of birdseed…it’s a really “cheep” substrate and when you are finished with the bin, you can feed it to the birds! 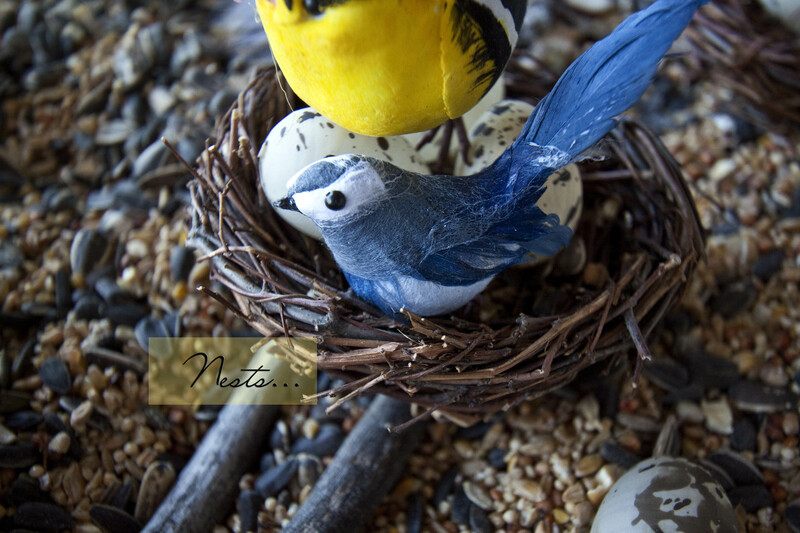 Next, you’ll need some little nests, I found these little nests at Michaels…$3.49 each. I bought 3 and I added one from my own crafty supplies, so we have 4. Now you will need some eggs. I used the small speckled ones we played with in our Spring table last week. I found them years ago at Michaels, but I’m sure you can find them still. They are plastic and hollow and will not shatter to pieces if dropped. Some of the paint is peeling off of mine because they have seen a lot of use, but we don’t mind. Well, we’ve got everything in there. Oh wait, we need birds! I found mine in various places, none of them were more than $4 each. Some were 2 for $3, some were less than. I have picked them up over time. I did see a nice selection at Michael, but be sure to watch what is under their bellies! Some of them don’t have feet!! A lot of them had little alligator clips on their bellies so they could be clipped to things. I think the kids will prefer birds with feet! Now it’s time to get playin’! 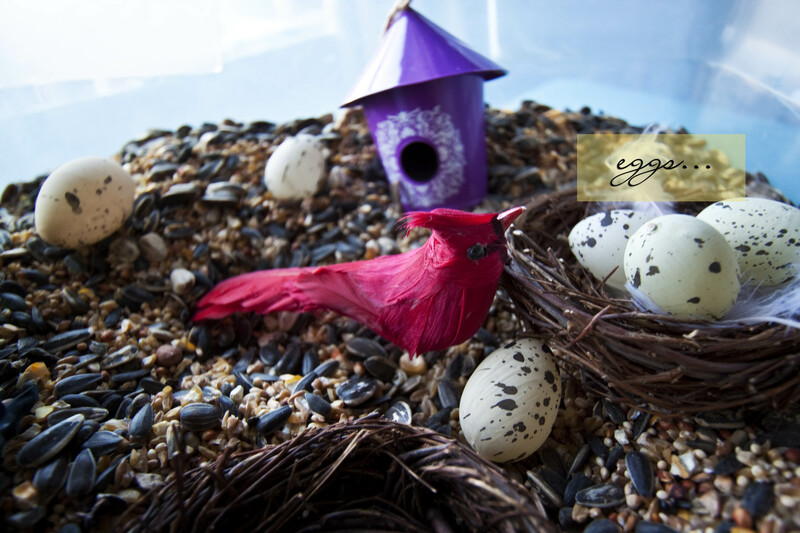 Chirp, chirp! 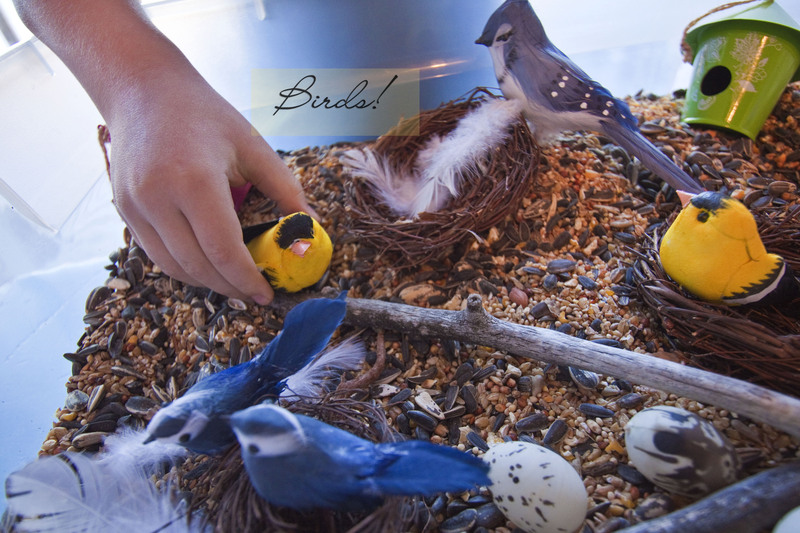 And yes, birdseed will spill out onto your table or floor. But so do sandwich crumbs and stubborn peas that won’t stay on their forks. Just remember…it sweeps up. But I would recommend not playing with it on shag carpet! Lol! 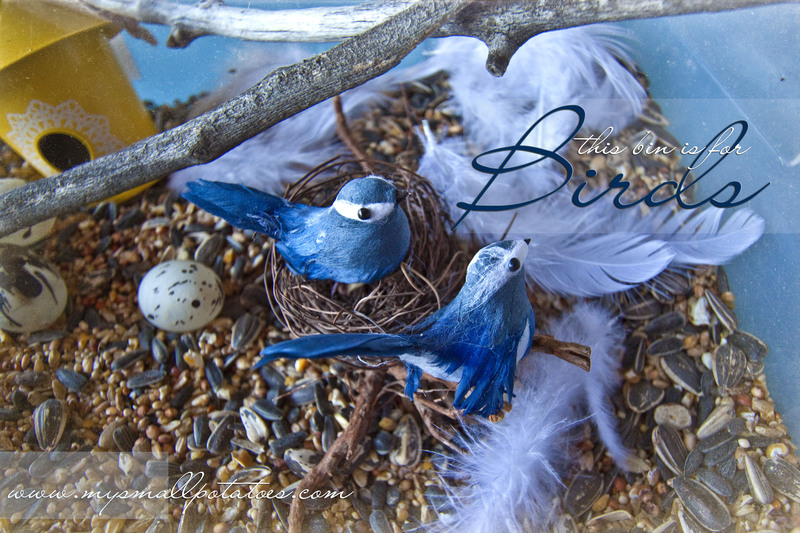 I am looking forward to many “twittery” bird activities in this unit, and I hope I will be able to share some more of them with you! 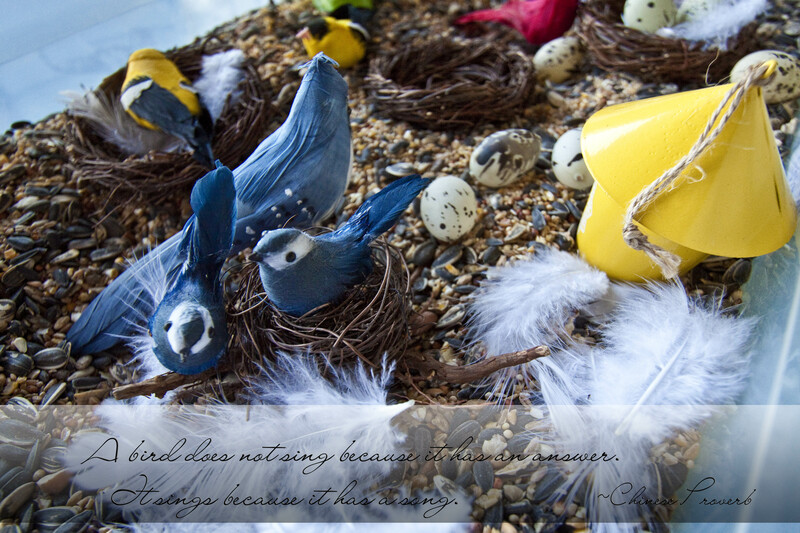 Happy Spring, everyone, and may it be the “chirpiest”! beautiful. 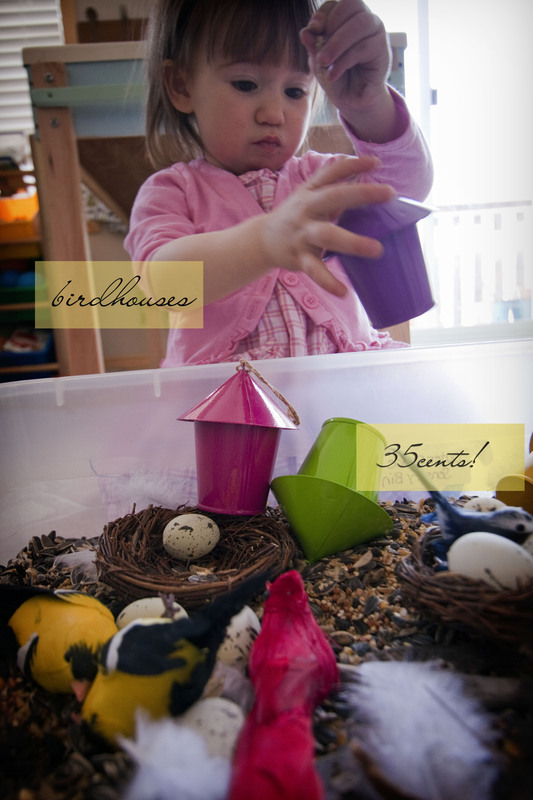 this is a brilliant idea, one I plan to try this coming week as our backyard is exploding with spring loving birds. thanks for linking to the Kids Weekly CoOp! Wow I love this idea. I have only just discovered your blog through KBN and your photos are amazing! !